Well the latest invite was for a newly opened restaurant just walking distance from my home, which is an added bonus—especially if I need to walk off the calories after a full meal. I booked a table for an early Friday evening dinner as I didn’t want to be there at peak supper time, but did want to get a sense of the energy in this Columbia-adjacent restaurant. While they didn’t seem to have my reservation when I arrived, I wouldn’t judge them for that—and they were very accomodating, so it more than made up for a little confusion upon arrival. George, the manager, was very friendly and welcoming with a great sense of humor that I hope he shares with the rest of his staff. George asked about my thoughts on wine, which is always a little tricky when it comes to Greek wines for me, so I told him what I generally like and he poured me a glass of Assyrtiko, which was the one familiar-looking name and hit the spot perfectly for me. For what it’s worth, I generally like a sauvignon blanc or sancerre when it comes to white wines. And their menu does include non-Greek options, but I was looking for that real Greco-experience. And George would be my guide. Ok, before I allowed him to fully plan out my whole menu I did order a selection of three spreads, because it’s something that I would do on my own. Especially with my tour guide brain of sharing and trying many things at once. Along with my pita, I chose to try the Melitzanosalata (smoked eggplant), Lemon Hummus, and Tzatziki. The tzatziki was my favorite of these three. I found the hummus to be a little bland. But after the disappointed look on George’s face that I should dare to order anything without his advisement, I followed suit from there on out. 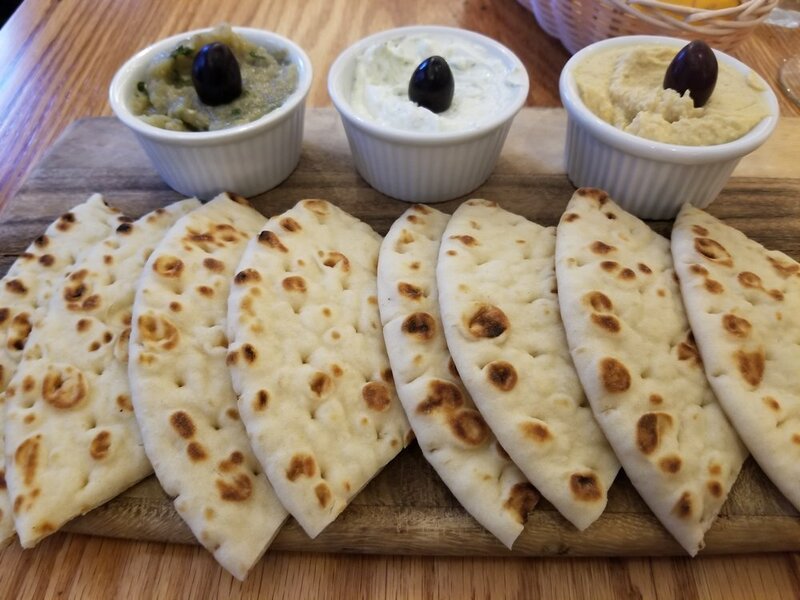 From left to right: Melitzanosalata, Tzatziki, Lemon Hummus, and the pita, of course. The next plate of food was significantly better than the last. Per George’s recommendation, I ordered the Octopus, which is described in the menu as chargrilled, and served with lemon & oregano. But this was really more like a salad. 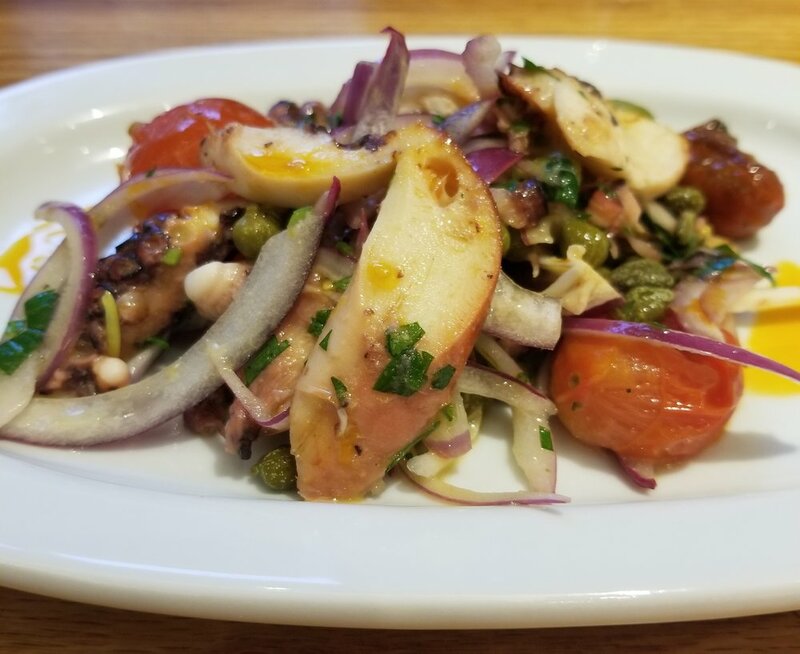 The beautifully cooked sea creature was served and dressed with red onions, capers, tomatoes and caper berries, which were a unique and flavorful pairing. In fact, I was actually rather surprised at how much else was on the plate, but for the most part it all worked really well together. If I had to make an adjustment, I might reduce the amount of extras on the plate—particularly the red onions and capers because I’m not going to eat those alone when I’ve gotten through the rest of the dish—especially if I’m on a date of some sort—which this restaurant would be perfect for. The ambiance is very warm and calming, and the perfect setting for anything from a family get together to a girls get together to a romantic evening with a special someone. George’s next suggestion was the Spanakopita, which is said was very homestyle cooking, like his grandmother would make. Well, I don’t have a Greek grandma, but I have been a New Yorker for the last 36+ years of my life, and I think we’ve got some pretty great Greek food here, so I was excited to try this take on the classic spinach pie. 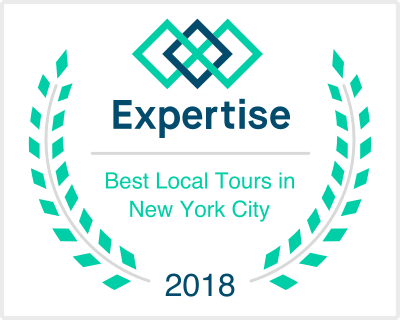 For the record, my favorite spanakopita in Manhattan is (STILL) from Poseidon Greek Bakery in Hell’s Kitchen, which you’ve likely tried if you’ve been on my Hell’s Kitchen food tour. They’re the last remaining shop in Manhattan to make their own phyllo dough, and you can taste the generations of love with every bite. My favorite in Queens—home to our lage Greek community? Titan Foods. They’ve been in business for over 30 years, and it shows. But, we’re not talking about either of those…we’re talking about Elysian Fields Cafe. The verdict on their spanakopita? Very good. I could definitely imagine this being made in someone’s home. It’s got a very hearty and rustic quality to it, which they offset by serving it over a little cream and topping it with some greens. It’s not light and airy like some of my favorites, but I would definitely order it again for a balanced and filling spinach pie. Are alfalfa sprouts really microgreens? While I was certainly not starved at this point, I did want to be sure that I also tried some land animal while I was there. So, again, I turned to my new friend, George for his guidance. With so many tempting offerings it was too hard for me to choose on my own. And I’m so glad I listened to him. 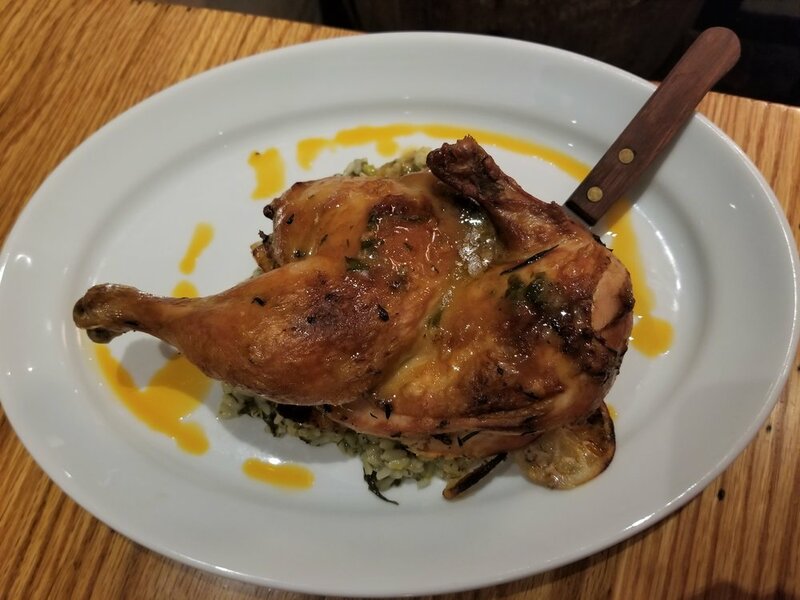 I often don’t order chicken entrees when I’m out unless they look truly extraordinary, which is a bit of a habit I’ve picked up from my mother. Essentially that it’s easy enough to prepare at home means that it shouldn’t be something I should indulge in outside. While it made more sense when I was cooking chicken frequently, that’s not really my style any more, so it’s probably worth kicking. I just think of all the great dishes I could be missing out on because of a stubborn idea about what I do in my own kitchen! Anyway, the next dish was the Roti Chicken, “oven-roasted half free range, lemon potatoes, pilaf.” And while the thought of double starches may scare off a more timid diner, I love both pilaf AND lemon potatoes—plus the actual plate of food was not overly packed with either. The chicken was truly the star of the show. The bird was so perfectly roasted with a great crisp on the skin and tender flesh inside—not at all dry. And the combination of preserved lemons with the rice and potatoes made it a surprisingly light-seeming dish. Of course, it’s not as light when you’ve already eaten your weight in pita, pie, and octopus. So, while I was not able to finish the dish myself—it made for great leftovers the following day. After dinner, I was treated to a little tour through the rest of the space, which included the private dining space downstairs and in the back, that they’re calling The Apollo Room. And if you’re wondering about the instances where you see Elysees or even “Champs-Élysées” on the menu, it actually translates into Elysian Fields or, you know, Greek Heaven. And I will say there is certainly an ethereal feeling there—but perhaps that was just the wine. Paradise? Or just a well-lit restaurant with a heavy pour? While I know that I was given special treatment on this evening, I have no doubt that the rest of the diners that enter these doors are treated hospitably. It’s definitely a place that I’ll return to in order to get the full experience—and especially as I have so many more dishes that I want to try. Plus, my parents love a good Greek Restaurant! 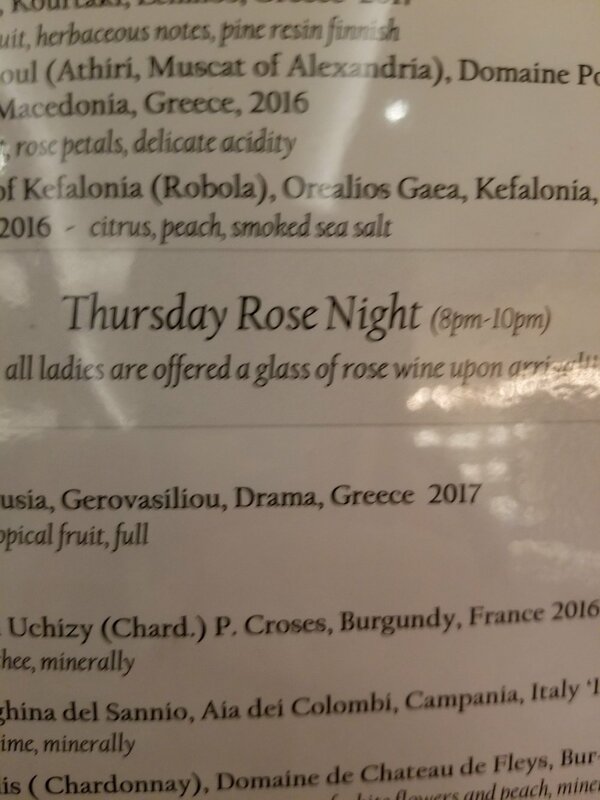 If nothing else, I think we all deserve to treat ourselves to a Rose Thursday every once in a while! So go get yourself some tasty Greek eats at Elysian Fields, and tell them that The Fun Foodie sent you looking for George! And if you’re going on a Thursday, please call me! Newer PostFOLK YOU, Brooklyn! Check out the 2019 Brooklyn Folk Festival, this weekend!